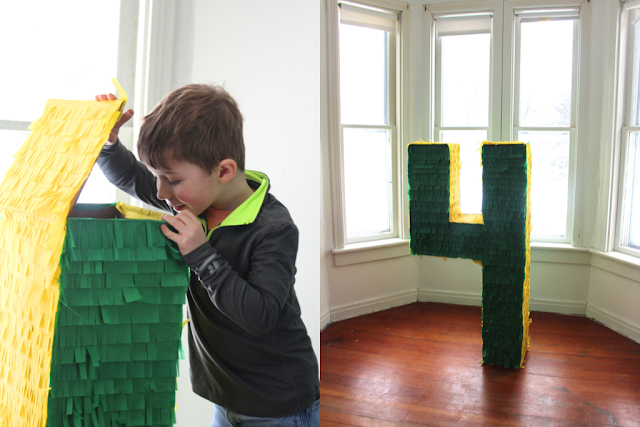 Ever since Parker busted open a piñata with a group of kids at the RMH, he has wanted his very own. So, I thought it would be fitting to make one for his birthday. And I could not be more pleased with how it turned out. 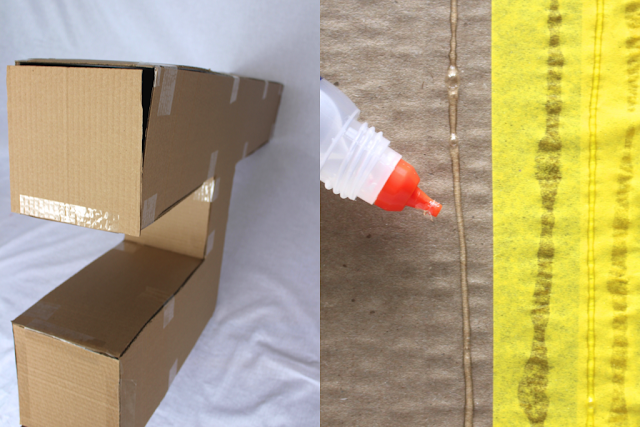 Materials: three large pieces of cardboard, tape, cutting tool + mat, pencil, tissue paper, glue. 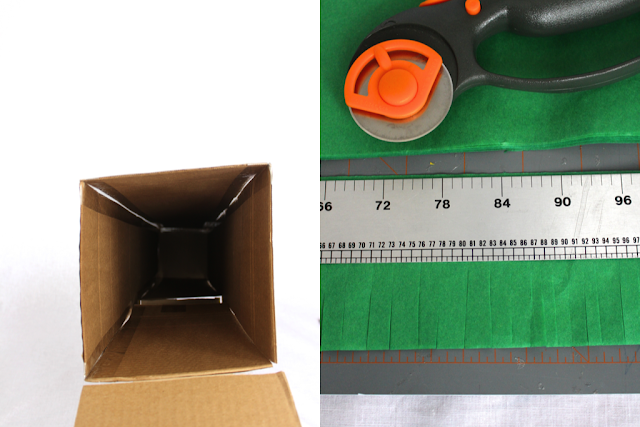 Process: Measure and cut out two large numbers from your oversized piece of cardboard. I made mine as big as possible because I wanted it to be my statement decoration. Next, cut out edge pieces from another piece of cardboard. Then, begin taping the box pieces together from the inside out. Don't forget to leave one flap open at the top. 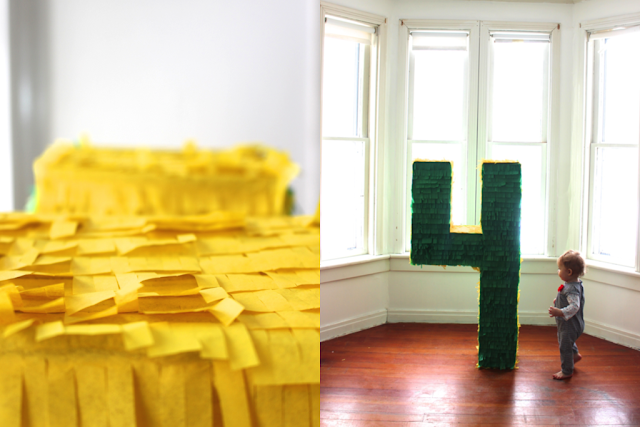 Once the number is put together, it is time to decorate. Lay out several sheets of tissue paper onto a cutting mat. 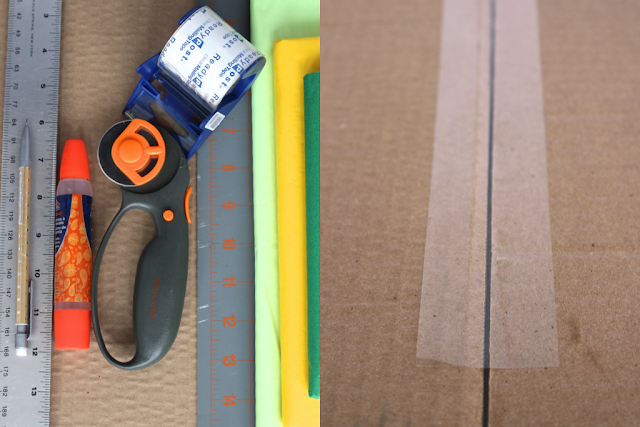 Use your ruler as a guide, begin cutting 1-inch slits into the tissue paper. Flip your ruler over and cut on the outside edge, separating your tissue fringe from the larger sheet. Now, you should have several 2-inch strips with fringe on one side. Next, start at the bottom of the box and begin gluing the fringe. With each layer, overlap to where the cuts begin. 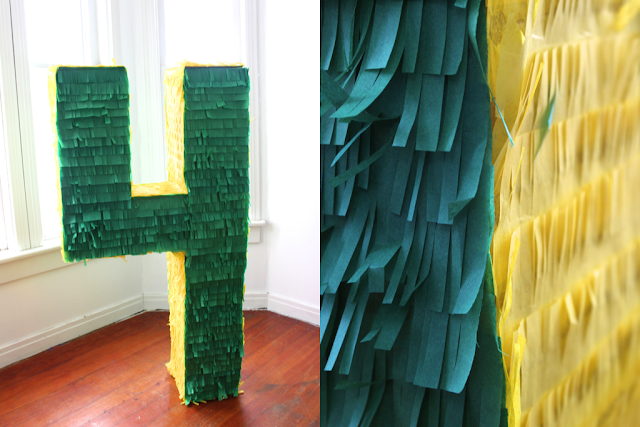 Continue this process until your entire piñata is covered with fringe. Fill with candy and let the party begin! Time: This project took a while. But I did it little by little. When I had a few minutes here and there, I would cut the strips of fringe. And on the weekend when Tyler and I would sit down for a movie, I would work on drawing the letters, cutting the cardboard, and taping it together. And then one day, while Matilda was napping, Parker helped me glue all the fringe into place. I would guess total it was about 4-5 hours over a week-long period.